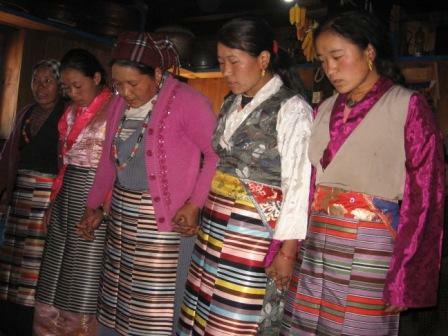 Beneficiaries: 450 people in 67 houses in the villages of Dimil and Juge. 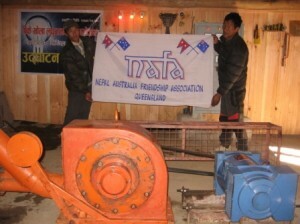 Objective: To install a 7 Kw micro hydro system in the village of Dimil which would produce power for 2 villages. Details: The Dimil and Juge residents applied for assistance through a semi goverment engineering company which provided part funding, and engineering assistance. This was a similar arrangement to the micro hydro projects NAFA has assisted in Tawal and Lumsa. Outcomes: The project was started in early 2013 and completed just a few months before NAFA members visited the village in January 2014. The construction was overseen by engineers and all work was up to same standard as the other MH projects. Water collection at the source and piping to the power station was well constructed and the electric turbine in the power house of similar quality to the others. The power lines to each house were installed correctly with surge protectors and safe wiring in each house to the overhead lights and power sockets. The villagers plan to start 2 small industries which will give the village extra income and employment to this predominately farming area. 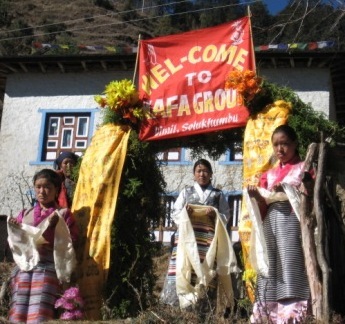 NAFA was thanked by the villagers for their funding assistance which has made a big change to their community. It is now easier to move around the house at night and children are able to study in the evenings. NAFA also rovided two pairs of industrial ear protectors for the oerators to be worn while working in the noisy power house.